Metal Roofing Alliance conducted a research study among 1,500 homeowners across US, and discovered a number of false perceptions that many homeowners have about this roofing material. Lets take a close look at what some homeowners think of metal roofs, vs what the reality is. As you will discover, today there is hardly a better, more durable, energy efficient and cost effective material than a metal roof. 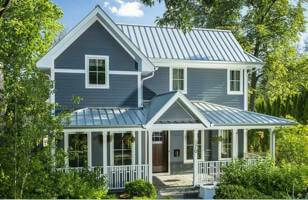 48% of homeowners worry that metal shingles or standing seam would not match their home style. 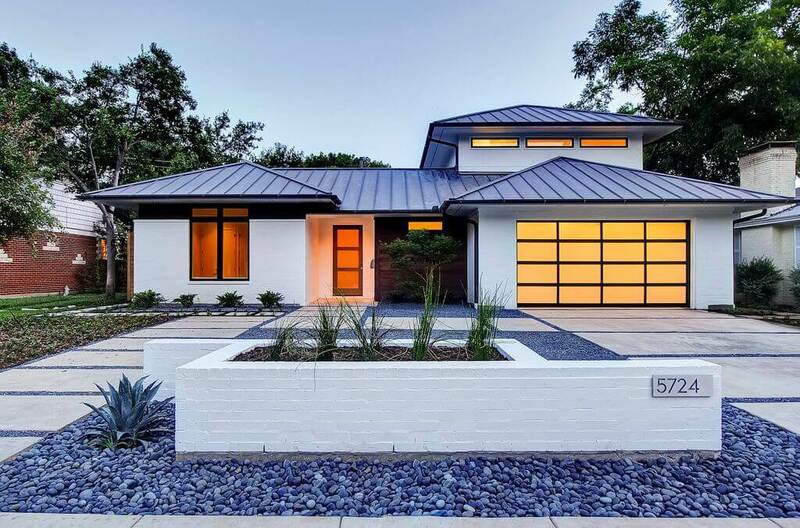 While it may be easy to imagine that a metal roof is a good fit for a modern home, many people have a hard time picturing this material on a traditional Colonial or a Victorian house. Fact: there are aluminum and steel roofs available in a wide range of profiles suitable for any architectural style (modern/contemporary, colonial, Victorian, ranch, cape, historic homes, etc). A standing seam roof is a great fit for contemporary architecture. However, it can also enhance the curb appeal of Colonial, Ranch and Log Cabin homes. This profile is ideal for the snow country, as it is designed to protect against ice dams. Another great benefit of a standing seam system is that its ideal for homeowners who want to install solar panels on their roof. There is no shortage of colors available, both pre-manufactured, and custom ordered. In recent years, many homeowners with modern houses have been keen on installing bare metal. It offers a very unique and bold look. 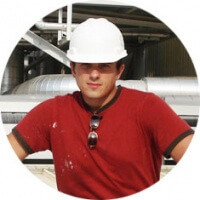 The greatest disadvantage of standing seam is the high cost. It is the most expensive of all metal roofs. Installation cost starts at $9 per square foot, but most homeowners pay $11-13 per square foot. Steel panels are the cheapest, aluminum is middle of the road, and zinc and copper standing seam is the most pricey. Aluminum or steel shingles work well with any classic architectural style: Colonial, Cape, Victorian, etc. 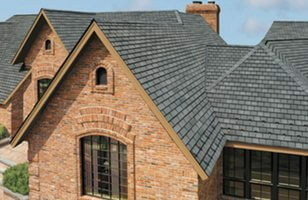 There are numerous products that imitate the look of architectural shingles, wood shake, and slate. When installed, most people looking at this roof would not be able to tell that its metal. For homeowners who are looking for an alternative to classic asphalt shingles, metal shingles are an ideal option. They are a lot more durable, longer lasting and energy efficient than composite roofs, while the price difference is very reasonable. At the low end, metal roof shingles start at $6.5 per square foot, which is only 30% more expensive than popular architectural shingles. However, this price range is comparable to the cost of expensive designer roof shingles, which will never last nearly as long as metal. Most, high quality metal shingles cost $7-8.5 per square foot. Those that are made from aluminum are 15-20% more expensive than steel shingles. Metal tiles are considered to be an upscale material and are more expensive than classic metal shingles. These are a perfect choice for Spanish/Mediterranean style houses, where installing a natural clay tile roof is not appropriate. Metal tiles can either be painted or made from stone coated steel. The most recognized and popular brand of stone coated shingles and tiles is Decra. 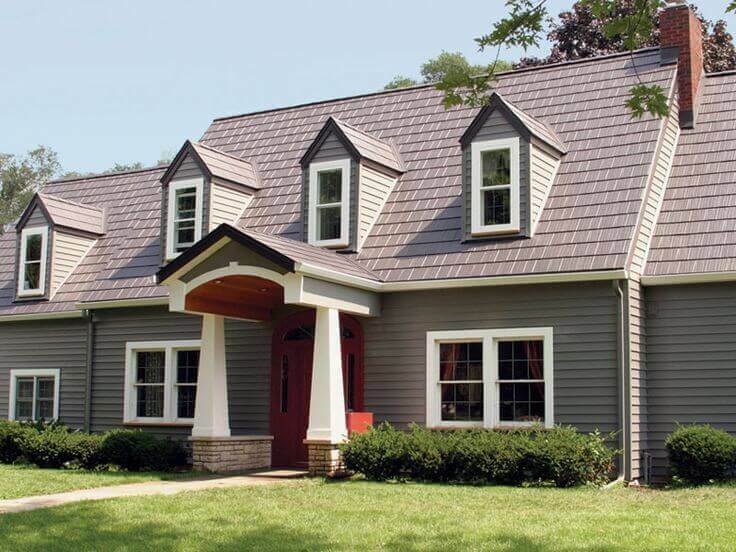 Stone coated metal shingles and tiles are the second most expensive metal roof, after standing seam. Prices range from $8 to 10 per square foot, including materials and installation. However, its important to realize that it terms of durability and weather protection, stone coated tiles offer no real advantage over painted metal shingles. The primary reason why people choose to install stone coated steel roofs is purely aesthetic: they do a great job replicating real clay tile. 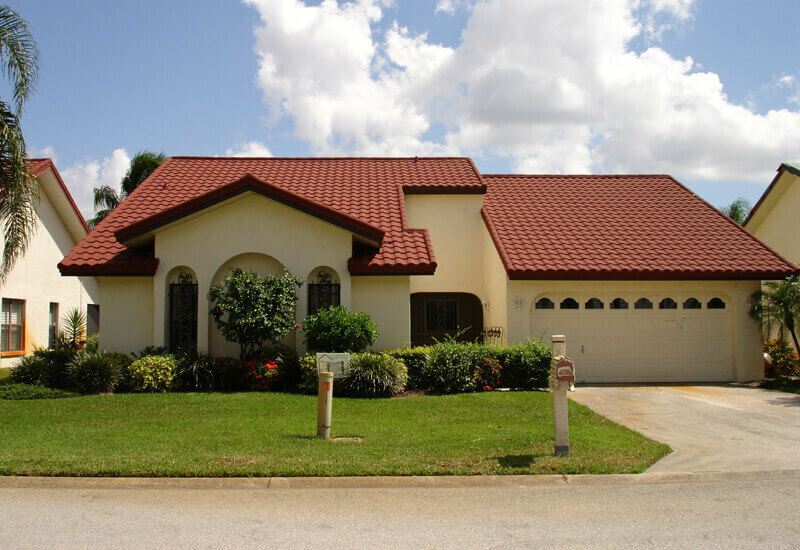 Compared to the cost of clay roofing, which is at least $15 per square foot, installing stone coated steel tile is a real bargain – you get a premium quality roof with a similar look for 50% less. 40% of respondents said that a metal roof may be too noisy. Fact: While it may come as a surprise to many homeowners, a metal roof can be even quieter than asphalt shingles. Contrary to popular belief, metal panels or shingles are not loud at all! An aluminum or steel roof has solid sheathing attached to the underlayment that actually helps silence the noise from rain, hail, falling branches and other weather conditions, better than other types of materials. So you do not ever have to worry about waking up to the sound of rain! This misconception may come from people being in barns or industrial warehouses that have tin roofs. Indeed these roofs are good conductors of noise, but that is because very thin sheet metal is used and there is no insulation. Since residential metal roofing adheres to much higher construction standards, there is no reason to compare it to these barn roofs and worry that they will be just as loud. 25% of people indicated that metal roofing is too expensive. Fact: One thing that many homeowners don’t think about is the TRUE lifetime cost of a roof vs. the initial cost you pay upfront. While the average cost of a metal roof is usually at least double the price of asphalt shingles, the latter will actually turn out to be more expensive in the long run. Once you install a quality aluminum, steel or copper roof, you will never need to worry about replacement again. The predicted life expectancy of a metal roof is at least 40-60 years, many last a lot longer. This means that you only incur a one time cost, upon installation. By contrast, when you put up asphalt shingles, you can expect them to last 12-20 years at best. This means that you will be replacing this roof 2-4 times over the same 40-60 year period. Consequently, you will end up spending at least double the amount, and probably more than it would have cost you to initially install a metal roof. On average, a new roof made of metal costs $8,500-13,000 to install on a 1,600 sq.ft. home. The prices range depends on the type of metal and profile you choose. 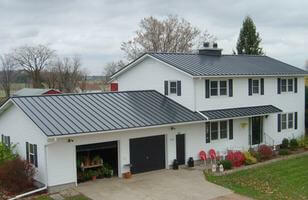 Standing seam is the most expensive, followed by stone coated steel tile, and metal shingles. The same size asphalt roof with the same installation complexity will cost $4,500-7,500 depending on the quality, style and brand of shingles you want. Moreover, roof replacement cost is not the only expense you need to consider, as you cannot forget maintenance and repair. If properly installed, metal will require minimal maintenance, which you can do yourself and will not require repairs. Comparatively, a quality asphalt roof will still require both maintenance and repair, as individual shingles tend to rot, warp, break, etc. 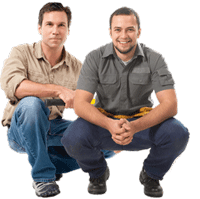 This means that you will be spending at least a few hundred dollars every year on various types of fixes. 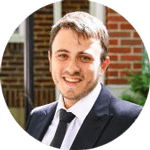 Over the years, this will add up to a hefty sum of money, in addition to stress and time you will waste looking for and dealing with contractors. Lastly, even the most expensive types of metal, such as copper, zinc and stainless steel, cost 30% less than the cheapest natural slate or tile roof. Cedar wood roofing costs about 20% more than aluminum, but lasts about 3 times less. Therefore, they are 3.5 times more expensive, when considering how often they must be replaced. 25% of respondents stated that metal roofs do not have an attractive appearance, because there are very few color choices. Fact: The notion that metal panels are ugly stems from popular images of old tin roofs on animal barns and industrial warehouses. All of them had the same bare metal color. In reality, there is a wide range of highly attractive metal colors that would satisfy even the most capricious taste. Once you start researching different options, you will find that the selection is just as extensive as for any other popular material, such as asphalt shingles. If you do not find what you want, it is possible to order a unique custom blend. Moreover, you have the additional advantage of selecting colors that are Energy Star rated as “cool”. They will help reduce your monthly spending on energy costs, as well as qualify you for a federal tax credit. When you consider different color coatings for your metal roof, be sure to select either Kynar 500 or Hylar 500 coatings. These will last a lot longer without chipping or fading compared to standard acrylic paint, and offer much better warranty terms. 17% of people indicated that there are other, better and longer-lasting materials. Fact: Considering that metal is a premium roofing material, it is logical to compare it to other high-end options. These are: real slate stone, clay tile and cedar shakes. When it comes to longevity, cedar shakes begin rotting just after twenty years. Natural slate and clay tile roofs do last a long time ( 50-100 years) but can crack and break randomly, requiring costly repairs. Additionally, in lieu of their heavy weight (6-9 lbs per sq.ft. ), these roofs need special structural support, before they can be installed. A quality metal roof will last just as long, but will not be subject to cracking and breaking. It is also lightweight, and will not strain your original home structure. When it comes to durability, metal will not break on impact (such as hail or a falling tree branch), where as both tile and slate will break and slide off. Steel and aluminum roofs can be walked on, without causing damage to the material. 12% of homeowners said they worry metal roofing would perform poorly in bad weather. Fact: When compared to other roofs, metal consistently demonstrates superior performance in a wide range of severe weather conditions. In fact, the majority of homeowners who end up installing a metal roof, do so largely because of the level of protection it affords when bad weather strikes. In the Northern states that get a lot of snow, ice and hail, metal shingles and standing seam roofs are unbeatable in protecting the home from ice dams and hail damage, which can cost thousands of dollars. 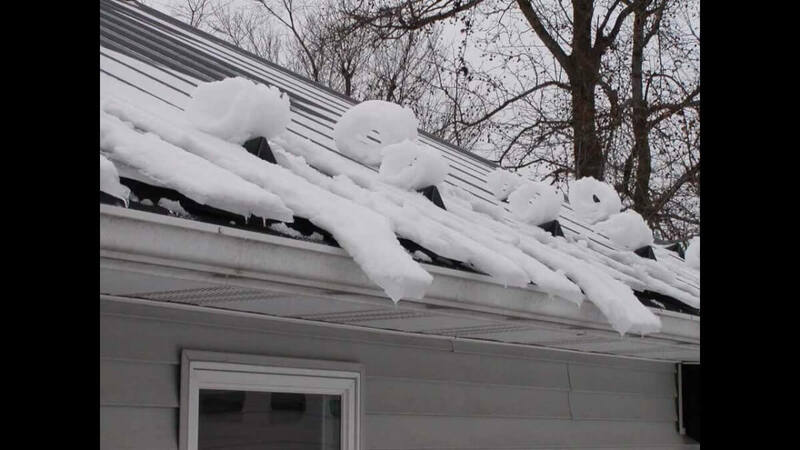 They shed snow extremely fast, prevent water from backing up on the roof and leaking inside your home. By contrast, asphalt shingles, tile and cedar shake are not a great snow-shedding systems. This means that all of them will leak. Natural slate is just as good as metal at protecting against water damage, but its triple the cost. In the Southern states, where homes are constantly exposed to the sun’s ultraviolet radiation, metal boasts the best energy efficiency. It will save you hundreds of dollars by cooling your home, because it reflects heat rather than absorbs it, like an asphalt shingles roof does. In the areas that are prone to wildfires, metal roofs protect homes from catching on fire. Metal is non-combustible and carries the highest fire rating of any material in the industry. In the regions that are exposed to hurricanes, metal will protect your home from suffering major damage, because it boasts at least a 140 mph wind rating. This means your roof will not be blown off or require extensive repairs, which as the case with asphalt shingles. By contrast, slate stone is not recommended for high wind areas at all. This is because slate tiles have huge wind uplift potential, as they are held in place by just a pair of nails or wire hangers. In turn, clay tile needs special cement, adhesives and fasteners to meet the minimum wind resistance requirements in the coastal areas, prone to strong winds/hurricanes. I just signed a contract for a metal roof with exposed screws, solar barrier, and ice/snow rails. Now I am second guessing my decision. Should I upgrade to a standing seam roof? The cost is almost double. What is an honest expectation of exposed screws? The exposed fastener roof will last a long while. However there will be maintenance cost – every 10-15 years you will need those screws re-tightened. I think a standing seam roof should cost about 1.5-1.8 times more than R-Panel… however it depends on roof layout and amount of flashing that needs to be done. If your roof is a simple gable, then it should not be that much more – just the difference in material cost and a slightly more complex (time consuming) installation. You do need to make a decision before your contractor orders/fabricates the panels. My wife and I have been thinking about hiring a residential metal roofing service to put a new roof on our house. I did not know that there are metal shingles as an option for the house. I do think that the metal roof would stand better in bad weather. That roof is either dark grey, or some sort of natural zinc. As far as samples, you should find local metal roofing shops / suppliers (not contractors), and look at color chips. That is the closes your will get to seeing real colors. Make sure color chips are actual metal pieces – not paper with paint. Paper will usually be way off. Do the screws used when installing a metal roof need to be replaced every 5 yrs. We just had one installed and this was never mentioned but a friend insists they do. Please clear up this debate. Thank you. Estelle, no, they don’t need to be replaced. However about every 10 years, they MAY need to be retightened .. and this is ONLY for exposed fastener metal roof – like 5-rib or v5 crimp standing seam. Why are not embossed Victorian Shingles more available for Victorian houses. Do pitches less than 4/12 eliminate the possibilty of their use? I had a steel roof installed 14 years ago on a very steep roof. It’s gone through several tough winters with heavy snow loads. No problem with the roof being noisy. I would certainly go with a steel roof again. My parents built their barn when I was still pretty young, and it has a metal roof. I’ve never noticed any sound when it rains or anything. I think what people are thinking of, is those plain sheets of wavy metal that you’d put on an old shed or something. Those can be loud. Metal roofing is way different than that. It is interesting that metal roofing isn’t as loud as it’s made out to be. I imagined that if I were to purchase a metal roof, I would get annoyed with the potential tinny sound caused by rain. This article mentions that metal roofing is often quieter than asphalt roofing due to the sheathing. This is definitely something to keep in mind when I purchase a new roof. We live in an area where it snows all the time. I am definitely one of the people who didn’t think that metal roofing would hold up well under bad weather. It’s good to know that it sheds snow quickly, but is there a rust problem? Rust and corrosion issues can arise, if you use cheap steel roofing or if you use steel roofs within 1 mile of the ocean. Otherwise, and good quality G90 or Galvalume steel panels should not rust. 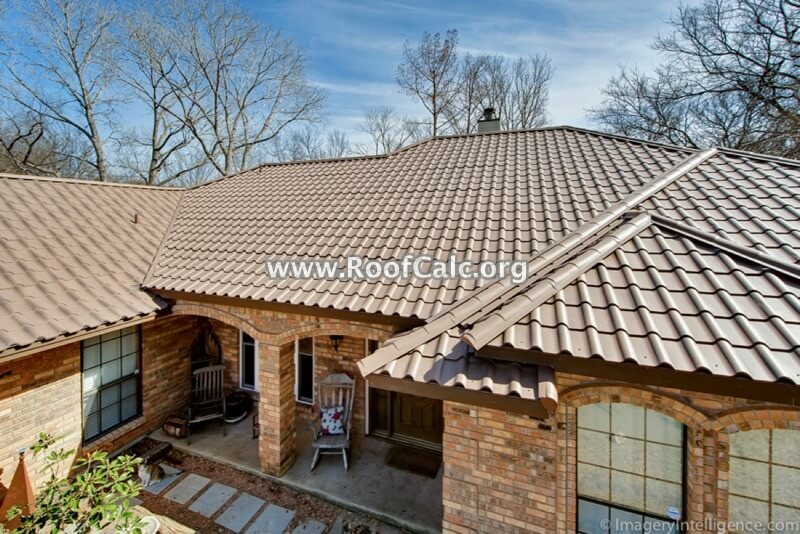 I used G90 steel shingles on my own roof, and after 6 years – no issues at all. The oldest steel roof that we have installed for a client is 11 years, and also no issues with paint or corrosion. We primarily installed TAMKO steel shingles. If you are still worried about rust / corrosion, then you should use aluminum roof. As far as snow – even if snow sits on the roof, it should not create any leaks or rust. We recently redid our roof with metal roofing and it looks great. We were able to choose from a variety of colors and picked one that really makes our house stand out. Hopefully, the metal will look great for years to come.